The EuroLeague Women (ELW) is the highest professional competition in Europe for women’s basketball. Although the word league is used, this is a knock-out cup competition starting with a mini-league phase. Admission into this competition is based on positions obtained in the clubs’ domestic leagues, and normally only the winner of the Final-4 or Final-8 automatically qualifies for the next edition. 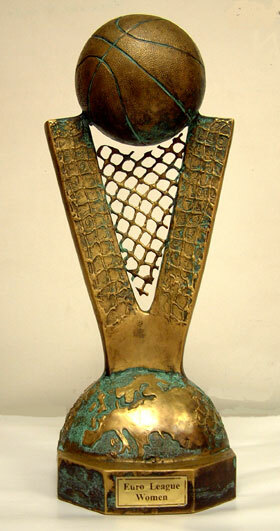 Before 1992 the ELW was called the European Cup for women’s champions club. In the early days it was dominated by clubs from Eastern Europe with Daugava Riga in particular. This club won the cup 18 times between 1959 and 1982. Then from 1983 until 1991 it was the turn of Italian clubs to monopolise the competition by winning it seven times. With the change of name the format of the competition changed. Between 1992 and 1996 the number of entrants each year varied. It was not until 1996-1997 the number of participants was fixed at 16 teams. That was the moment a real mini-league structure took shape. Two groups of eight teams were formed with the top 4 qualifying for the knock-out stage. This format was used until 2004-2005 with the exception of 2000-2001. In 2004-2005 21 teams took part having been split into three groups of seven teams. At the end of the league phase five teams were eliminated and then the competition reverted to a knock-out system. The next two seasons the same format was used but only 18 teams participated. As the structure was criticised a lot for the elimination of only two teams at the end of the first phase FIBA Europe decided, for the season of 2007-2008, to increase the number of teams to 24. Hence the teams were split into four groups of six teams with the first four teams of each group qualifying for the knock-out stage. 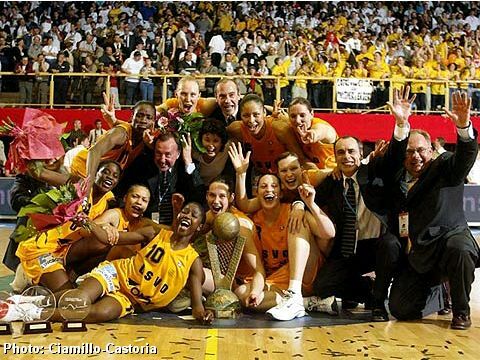 Bourges Basket (CJM Bourges) and US Valenciennes Olympic (USVO) are the only French clubs to have won the EuroLeague Women trophy. Bourges won it on three occasions in 1997, 1998 and 2001 while USVO lifted it twice in 2001 and 2004. France were awarded four places in ELW competition by FIBA Europe for the 2007-2008 season. The French Federation allocated the places to USVO as French Champions, Bourges as winner of the Tournoi de la Fédération (Federation Cup), to Villeneuve D’Ascq as 3rd place at the end of the regular season and to Mondeville that were 5th at the end of the regular season. Montpellier that finished in 4th place declined its participation. For more up-to-date history of the competition select the season of interest from the right margin.